Gas prices are steadily heading back to $4.00 per gallon in some places, particularly California and the U.S. West Coast. The price of gas in most regions of the U.S. is now between $3.70 and $3.80. A continual rise in crude oil prices has solidly impacted the price of gasoline at the pump, with the weekly gas price survey showing fuel costs higher from coast to coast, regardless of whether you drive a regular car or a tractor-trailer rig. The price of a gallon of regular unleaded jumped nearly a nickel per gallon during the past week, while diesel prices jumped by about four-cents per gallon. Overall, the national average gas price is up about 19-cents versus this time last year. Diesel prices are up about 12 cents per gallon, year over year. The spike in prices has officially placed the U.S. average fuel cost higher than had been predicted by the U.S. Department of Energy. During the spring, the Energy Information Administration had predicted overall fuel prices would be around $3.63 over the summer. 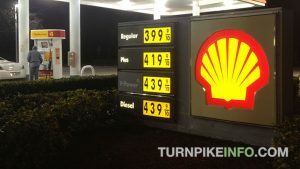 While prices along the lower Atlantic states and across the Gulf Coast are below that figure, most drivers across the United States are now paying anywhere from $3.71 across the Central Atlantic to nearly $4.00 across the West Coast. Diesel costs are now at or above that $4.00 per gallon threshold, with no signs of abating in the near future. The cost of gas is being driven, to turn a phrase, by upward prices on crude oil. West Texas Intermediate crude has nearly matched up with the price of Brent Light Sweet Crude, rallying over the course of several months to keep the cost of a barrel of oil well above $100. European investors traded back some of their U.S. oil futures on Monday, July 22, in favor of profit-taking, several observers, including CNBC’s Jim Cramer, say oil is likely to only go higher. A per-barrel price of about $110 is still seen as very likely, meaning the summer driving season will give way to a back-to-school season with even higher gas prices.